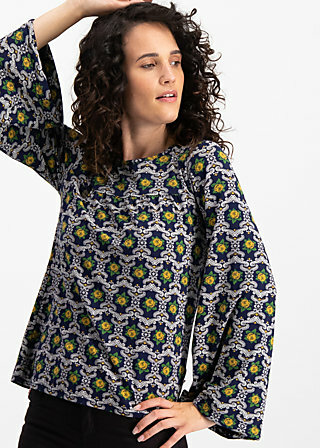 Loose-fitting single jersey shirt made of a soft falling cotton-modal-elastane blend – a Blutsgeschwister firework of textile colours and patterns! The charming and snugly fitted A-line and casual trumpet sleeves turn this well-known and much loved long-sleeved shirt into an it-piece with an elegant retro flair. A fine drawstring with a narrow elastic band in the sleeve hemline makes it possible to quickly tighten the sleeve from wide to slim; the back of the crew neck has a slit with a playful lacing. The straight front yoke is embellished with a fine accessory: The ribbon with a Blutsgeschwister record-pendant makes hearts beat faster. Behind colour 3 a very special story is hiding, as we have revived our favourite most favourite pattern from the past. Glamour(d)rama Yeah! The fabric “iceflower-ornament” can be easily combined with those fabrics.